Blades for meat slicers, prep equipment, can openers, blenders, wedgers, scrapers, food processors, choppers, grinders. Blade & Holder, Assembly 1/2"
Commonly used on Nemco models such as: 55450-1, 55450-2, 55450-3, 55450-4, 55450-5, 55450-6, 55650, N55500, N55500-1, N55500-2, N55500-3, N55550-6, N55550-8, N55600 and where part is applicable. Use for Prince Castle models 910, 943, 943-A, 943-AH, 943-B, 943-BK, 943-C, 943-D and where part is applicable. Commonly used on Nemco models such as: 55450-1, 55450-2, 55450-3, 55450-4, 55450-5, 55450-6, N55500, N55500-1, N55500-2, N55500-3, N55500-4, N55550, N55550-6 and where part is applicable. Commonly used on Nemco models such as: 55450-1, 55450-2, 55450-3, 55450-4, 55450-5, 55450-6, 55450-8, 55550-8, N55500, N55500-1, N55500-2, N55500-3, N55500-4, N55550, N55550-6, N55550-8, N55550-8C and where part is applicable. Hardened steel teeth, true tempered for life. Used on various Waring models such as WFP11 and where part is applicable. Blade & Holder Assembly 3/8 "
Used on various Nemco models such as N55500, 55450-1, 55450-2, 55450-3, 55450-4, 55450-5, 55450-6, N55500-1, N55500-2, N55500-3, N55500-4, and where part is applicable. Used on Vollrath and Redco models such as EC0654, 0654, 654. Used on tomato slicer models such as Vollrath, Redco; 643N, 6435GN, 644N, 644SGN, 646N, 690SGN, 6915SGN, 694SGN. Econo Pros and Tomato Pros series where part is applicable.. Commonly used on tomato slicers. BLADE ASSEMBLY 11 BLADES 1/4"
Used on various Lincoln/Redco models such as: 0643N, 0643SGN, 0644N, 0644SGN, 0646N, ECONO PRO, TOMATO PRO, Tomato Pro and where part is applicable. Used on various Lincoln models such as 500 Series, 500N, 501N, 501N Onion King, 502N, Onion King and where part is applicable. Commonly used on Prince Castle models such as: 908-A, Core Bundle and where part is applicable. Commonly used on Nemco Easy Tomato Slicer models such as: 55600-1, 55600-2, 55600-3, 55600-4, N55600 Series, and where part is applicable. Commonly used on tomato slicer model E531, E530SGP. Commonly used on tomato slicer. Commonly used on various Lincoln/Redco models such as: Tomato Pro, Econo Pro, 0643N, 0643SGN, 0644N, 0644SGN, 0646N and where part is applicable. Used on Vollrath, Redco models such as EC0656, 656, 0656. Used on tomato slicer models such as Vollrath, Redco; 643N, 6435GN, 644N, 644SGN, 646N, 690SGN, 6915SGN, 694SGN. Econo Pros and Tomato Pros series where part is applicable.. Commonly Used on Vollrath-Redco Tomato King model 044N. Commonly used on Prince Castle models such a : 910, 910-A and where part is applicable. Used on tomato slicer models such as Vollrath, Redco; 643N, 6435GN, 644N, 644SGN, 646N, 690SGN, 6915SGN, 694SGN. Econo Pros and Tomato Pros series where part is applicable..
commonly used on Vollrath/Redco models such as 643N, 643SGN, 644N, 644SGN, 645N, 645SGN, 690SGN, 691SGN, 694SGN. Used on Various Lincoln/Redco models such as: 0643N, 0643SGN, 0644N, 0644SGN, 0646N, ECONO PRO, HFC-24, HFC-36, TOMATO PRO 0644N and where part is applicable. Commonly used on Prince Castle models such as: 910, 943, 943-A, 943-B, 943-BK, 943-BMC, 943-C, 943-D, 943-DH, 943-DMC and where part is applicable. Commonly used on various Univex models such as 6509, 7510, 7512, 8510, 8512 and where part is applicable. Please verify serial number when ordering. If the words Boston, Boston by Univex appear any where on the slicer this part will not fit. Commonly used on Prince Castle models such as: 910, 943, 943-A, 943-B, 943-BH, 943-BK, 943-BMC, 943-C, 943-D, 943-DMC and where part is applicable. Commonly used on Oliver models 709, 711, 730, 732-N, 777-N, 777N, 797-32, 797-32C, 797-32N, 797-32NC, 797-48, 797-48N and where part is applicable. Note: Factory strongly recommends replacing all 32 blades at the same time in order to maintain an even cut. Commonly used on Lincoln Redco models: INSTASLICE, TOMATOR SLICER; 15000, 15102, 15103, 15104, 15105. Commonly used on various Vollrath, Redco, models such as: 15000, 15005, 15006, Instacut 3.5, Instacut 3.5W and where part is applicable. BLADE, EASY TOMATO SLICER ASSEMBLY 3/16"
Commonly used on Nemco models such as: 55600-1, 55600-2, 55600-3, 55600-7, 55650, N55600 and where part is applicable. Used on units with SIX side shaft. Used on various Robot Coupe models, such as: R300, R301, R301 Ultra and where part is applicable. NOTE: Not for R301 Series D or R301 Ultra Series D.
Used on various Robot Coupe models such as Blixer 5V and where part is applicable. Commonly Used on various Bizerba models such as G13, SE355, SE12, SE128, A330FB, A330, A400, A404,1194, SE8, SE12, SG8D, VS8, VS8D, VS8F, VS8A, VS12 and where part is applicable. Used on Various Lincoln/Redco/Vollrath models such as: 0643N, 0643SGN, 0644N, 0644SGN, 0646N, ECONO PRO, HFC-24, HFC-36, TOMATO PRO 0644N and where part is applicable. Commonly used on models: 1002, 1230, 5006, 5012, 5057, 56500-2, Bar Boss 5039, Vita-Mix, VITA-MIX, VM0100, VM0100A, Total Nutrition Centers, Vita-Prep, TurboBlend 4500, TurboBlend 2 Speed Blender Model 1782 where part is applicable. 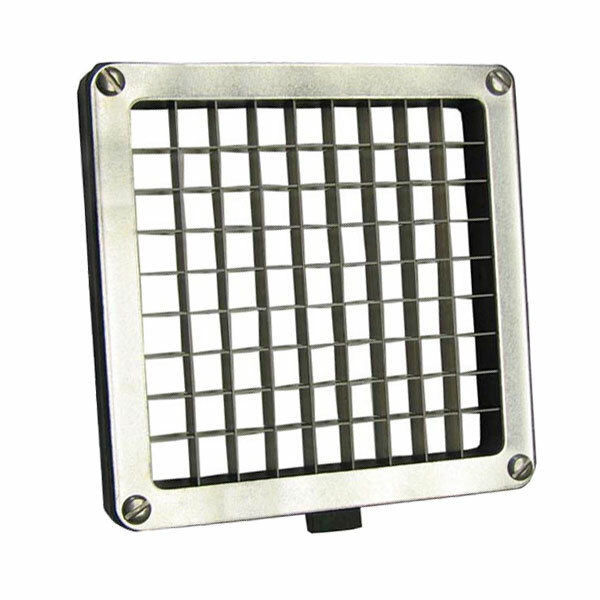 Commonly used on Nemco models such as: 55600-1, 55600-2, 55600-3, 55600-7, N55600 and where part is applicable. Easy Tomato Slicer Blade Assembly, 1/4"
Used with grater attachment for a #12 or #22 Hub. Commonly used on Alfa model: VS88H and where applicable on other models. Commonly used on models: 1002, 1230, 5006, 5012, 5057, Bar Boss 5039, Vita-Mix, VITA-MIX, VM0100, VM0100A, Total Nutrition Centers, Vita-Prep, TurboBlend 4500, TurboBlend 2 Speed Blender Model 1782 where part is applicable. Commonly used on Silver King models such as: SK2SB, SKK2 and where part is applicable. Center of hole to center of hole is 7/16"
Used on various Pro-Cut models such KMS-13 and where part is applicable. Commonly used on various Univex models such as MG22, 22HCCA and where part is applicable. Commonly used on various Silver King models such as: SKK-1, SKK-2, SKK2, SK2SB, and where part is applicable. Use for Globe models such as 300, 400, 500, 720, 725, 770, 775, 820, 825, 850L, 875L. 4 Screw Mounting Holes, 1/4"
Commonly used on various Univex models such as 6512, 7510, 7512, 8512 after 08/2000, 9512 and where part is applicable. Must provide model, serial number and ML # at checkout to confirm accuracy of part. If information not provided, then the part is Non-Returnable. Commonly used on Globe models: 3600, 3850, 3975, 4600, 4975 and where applicable.